One of our latest product is the bulk whatsapp plat form which permits you to send whatsapp messages to million of people. This system comes with an easy to use interphase and a number filter that helps you detect numbers that are active on whatsApp. With the increasing number of whatsapp subcribers(1 billion+) targeting whatsapp users can be a game changer in your business. 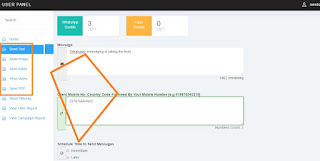 In my last post, i wrote on Bulk whatsApp Messaging Online Tool. In this post we are going to see the steps involve in sending a bulk whatsApp message. Let us get stared. #2 Login into your account and click on ''send text'' send image'' ''send Audio'' send video'', send pdf'' depending on what you need to send to your contact. #3 Types in the message box your text or upload the file you want to send and add a caption if need be. #4 .Enter the numbers you want to send message to. You can copy and paste numbers from excel. We are working on an import option . 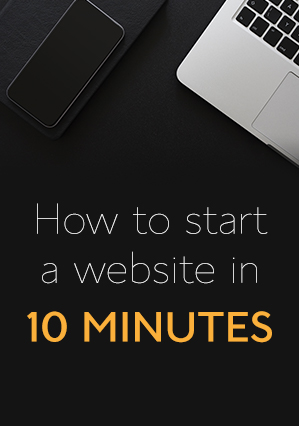 The next thing to do is deciding when to send your campaign. 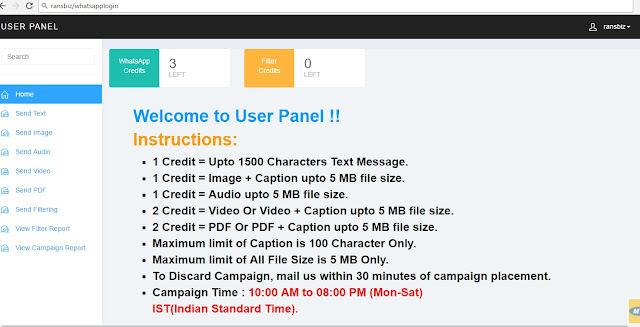 You can send your Campaign immediately or Later by selecting the desired plan just below the number box. #5 . Click on submit and that is it. You should see a confirmation message as indicated in the screen shot below. Note that,In order to send a campaign you must have Whats app credits in your account. Campaigns are sent from 4:30 GMT to 14 GMT everyday. Below in brief shows how credits are calculated using our system. 1 Credit = Upto 1500 Characters Text Message. 1 Credit = Image + Caption upto 5 MB file size. 1 Credit = Audio upto 5 MB file size. 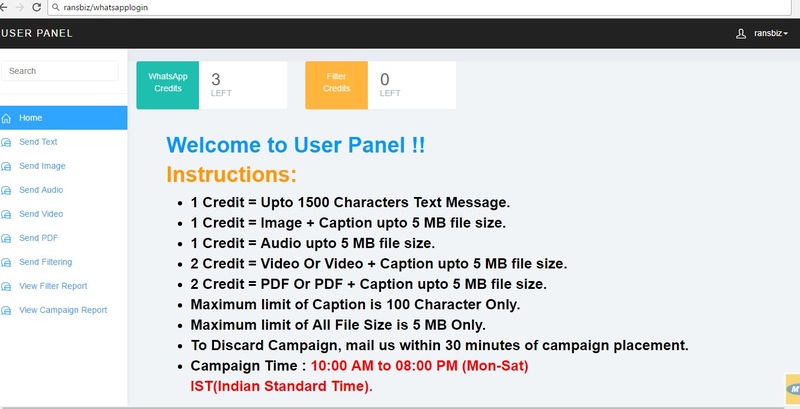 2 Credit = Video Or Video + Caption upto 5 MB file size. 2 Credit = PDF Or PDF + Caption upto 5 MB file size. Maximum limit of Caption is 100 Character Only. The Filtering option is used to identify numbers that are not found on whatsApp from your list or data base. After sending your campaign. You can check the success of the campaign by checking out '' View Campaign Report'' . This tells you number of messages delivered. Any undelivered message in this system is returned into your account. As for the moment, Campaign reports shows number of telephone numbers message had been sent to, the type of campaign( text,image, pdf,video or audio), Status of messages(usually done or discarded) and the time campaign was submitted. . You can also select the desired parameter you want to monitor in th Campaign report section.This is what makes the service trust worthy and reliable.